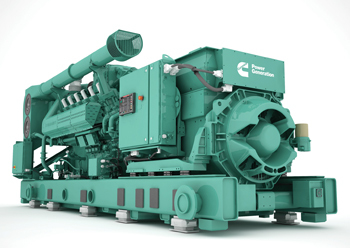 The HSK78G ... designed to generate power in extreme climates. Fuelling the next generation of power, the series offers a total package of gas generator capabilities and innovative gas technology for prime and peaking power applications. With a power density of up to 2.0 MW from a 78-litre engine, the HSK78G generator series is designed to provide reliable power, regardless of the natural gas source or the climate, including extreme heat up to a blistering 55 deg Celsius and extreme altitudes, says a company official. “This new technology represents a bold step into the gas arena for Cummins that pushes new levels of efficiency, transient performance and gas variation well beyond former natural gas generators,” says Craig Wilkins, director of Cummins Prime Power Segment and Global Sales Support. According to Wilkins, the HSK78G models are suitable for a diverse set of industries from mining and manufacturing to shopping malls and hospitals. “The new generator series has been designed to push the boundaries of performance to extremes while achieving a low total cost of ownership. A high electrical efficiency of up to 44.2 per cent (50 Hz) and 43.5 per cent (60 Hz) is achieved on a wide range of pipeline natural gas down to 70 methane number (MN) without impacting power output and efficiency,” he says. “In addition, the barrier-breaking fuel flexibility of the HSK78G enables the utilisation of low-cost, low-BTU and free fuel sources, that would otherwise be considered waste products, delivering robust power even with very aggressive fuels with minimal derating,” he adds. Cummins designs, manufactures, distributes and services a broad portfolio of power solutions. Its products range from diesel and natural gas engines to hybrid and electric platforms, as well as related technologies, including battery and fuel systems, controls, and electrical power generation systems. Headquartered in Columbus, Indiana, US, Cummins currently employs 58,600 people and serves customers in about 190 countries through a network of some 500 company-owned and independent distributor locations and 7,500 dealer locations. Cummins earned $1 billion on sales of $20.4 billion in 2017.